It isn’t always possible to secure your motorcycle to something immovable, especially whilst at work or even at home in your garage. Ground anchors are now becoming increasing popular as another deterrent to any aspiring motorcycle thieves who are looking for an easy ride. They need to be set into concrete to be as secure as possible so if your garage floor is a concrete slab or you’re lucky enough to have a designated parking space at the office AND nobody minds you cutting out a square of tarmac and putting some concrete down, these just might be for you. 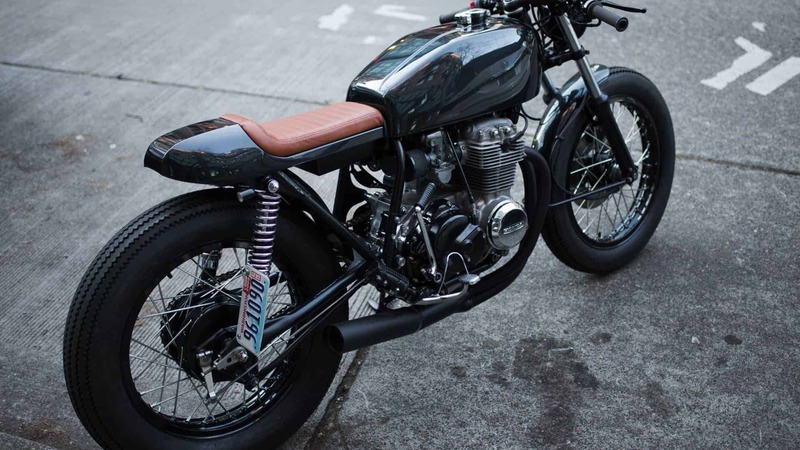 Welcome to our best motorcycle ground anchors round up and review. 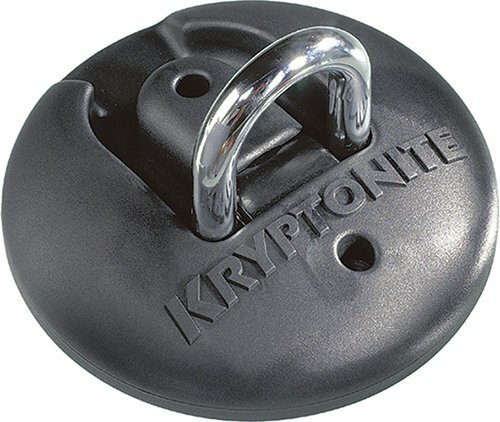 Kryptonite’s Stronghold is an all in one solution, complete with the masonry bits required to drill the bolt holes as well as hardened security balls and circular cover discs to stop the 5/8” bolts being unscrewed or attacked once installed. The shackle is 16mm of hardened carbon alloy steel and lays flat when not in use. The plastic cover that fits over the entire assembly also has rounded edges and is dome shaped so that it can safely be driven over. Once this anchor is fitted, nothing can be slid underneath it to try and prise it out of the ground. The reasonable price might have you thinking that this ground anchor isn’t up to much but the fact that it achieved Sold Secure Gold, Thatcham Category 3 and an ART rating of 4/5 should tell you that this is one serious piece of kit which is why it takes our top spot. Next up is the Anchor GRANIT which uses a similar design to the Stronghold but is just lacking in a few features. A 16mm hardened steel shackle is utilised which again folds flat when not in use. Four expanding steel anchor bolts are supplied to fix this into the ground but Abus has not supplied any drill bits so you’ll have to find those yourself. There is a cover supplied which does integrate quite well but does not protect the shackle as well as the Kryptonite. The shackle is also wider which is great if you’re using multiple chains and locks but if just the one, there is a little more space available to insert a set of bolt cutters. 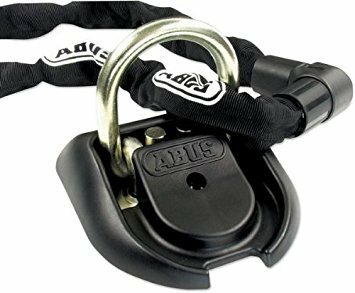 Abus have managed to secure Sold Secure Gold, Thatcham Category 3 and a 4/5 ART rating making this motorcycle ground anchor a worthy contender. Abus also suggest it can be mounted to a wall. 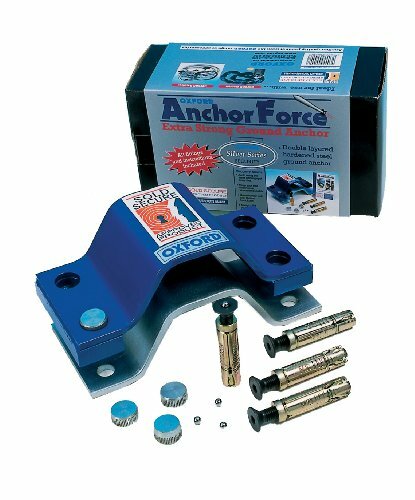 Oxford are well known within the motorcycle security industry and the Anchor Force does not disappoint. A different design approach has been taken here with no conventional shackle hoop acting as the locking point. Instead, two hardened steel plates are provided which are bolted into the ground where you can then pass your chains underneath and through the anchor. Four expanding bolts are supplied but again no drill bits of which you’ll need a 5/16” and 5/8”. Hardened security caps and balls are present but we have heard reports of these loosening the anchor bolts once hammered on top. We had no such issues but make sure the instructions are followed. The Anchor Force is definitely tough and should at least be considered with its Sold Secure Gold rating. Xena have updated their XGA model making it better than ever. It still features a single bolt installation as well as its unique sealed steal face design with no access to the mounting point. Its 21mm steel shackle which is one of the largest we’ve seen is able to swivel 360 degrees and can be folded flat and is safe to drive over. 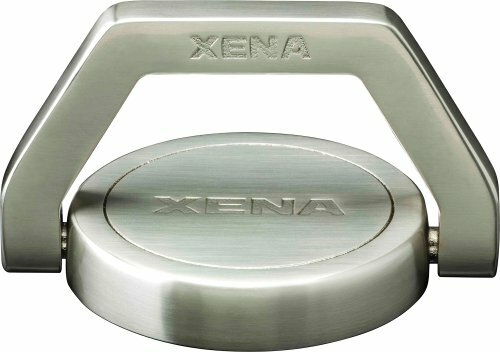 Wall or floor mountable, we do like the XGA but aren’t quite sure how it would stand up to being pulled out of its mounting hole due to its single bolt fixing. With that being said, it has obtained the Sold Secure Gold standard which means that it is able to the withstand most conventional attacks. No drill bits supplied. Bringing up the rear is the entry level offering from Oxford. A conventional two bolt design with ball bearings supplied which can be hammered into the heads to be prevent removal. The shackle section isn’t as thick as the Anchor Force, making do with just one layer of steel instead of two. 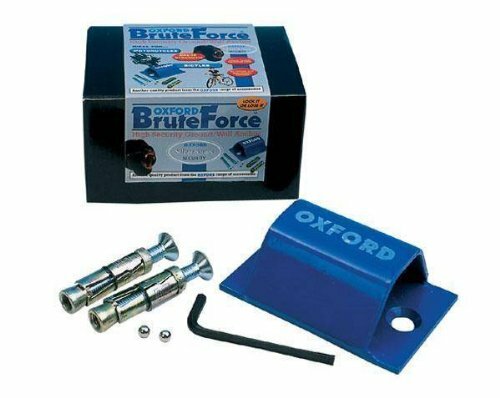 For those on a budget who are willing to compromise on features a little, the Brute Force might be the option for you. Sold Secured Silver. And that concludes our review and round up of the best motorcycle ground anchors available. We hope it was useful and as always feel free to end us a message with your experiences.